Pets Costs > How Much Does a Green Cheek Conure Cost? How Much Does a Green Cheek Conure Cost? The green cheek conure (Pyrrhura mollinae), known to be highly inquisitive, bold and engaging, can be very playful and affection when compared other types of conures. How much does it cost to buy a green cheek conure? The cost of a green cheek conure will greatly depend on the breeder you purchase from, the age of the bird, the quality, colors/mutations and geographical location of the breeder. From what we researched, the average cost of a high-quality bird tends to be inside the $300 to the $600 range for an odd mutation but you could find birds as little as $125. For this price, you should expect a weaned and ready to come home bird for the average owner. While the bird can live fine on its own, breeders and experts often recommend pairs to help one bond with one another. A green conure should never be housed with other types of birds. At BirdBreeders.com, for instance, there was close to 30 active listings at the time of this publishing, with prices ranging anywhere from $950 for a tame baby to as little as $250 for a weaned baby from a breeder in North Carolina. LuckyFeathers.com, a professional bird breeder with more than 30 years of breeding ethics, noted his prices on his official price sheet. According to the “sold babies” subpage, the prices ranged anywhere from $250 to $300, with shipping an additional $59. A well-balanced diet will consist of 60 percent specialized pellets, with the remaining consisting of fresh vegetables, fruits and a few fortified seeds. Avoid feeding any bird avocado, fruit seeds, anything with caffeine, sugar, high-fat treats, chocolate or alcohol as this can cause serious health problems in the future. All fruits and vegetables should remain fresh and should be discarded if the conure doesn’t consume after two to three hours. As with any bird, the water will need to be changed daily and should be available at all times. While treats are okay, try to limit it to 5 to 10 percent of its diet. Green cheek conures will acclimate the best in 65 to 80 Fahrenheit, but even with comfortable temperatures, it’s best to avoid extreme temperature changes. All housing units should be placed off the floor in a well-lit area away from any vents. A habitat, while the larger the better, should be, at a minimum, 24″W x 24″D x 30″H, with metal bars spaced no greater than ½” to ¾” apart, according to this Petco care sheet. Inside the cage should be a variety of perches, at least nine inches longer. These perches help with physical activity and can even help prevent arthritis in the future. Like perches, a variety of toys should be included as they like to chew and keep stimulated throughout the day. These toys and perches should not contain any lead, zinc, galvanized parts and/or lead-based paints as this can cause serious medical issues for the bird. On the bottom of the cage should include a metal grate, which is designed to collect any bird droppings to help avoid any contamination with the bird’s food and water. Line this metal grate with a substrate to allow for easy cleaning. Once a week, the habitat and all of its inclusions, such as the perches, should be cleaned with a 3% bleach solution and all of the substrate in the metal grate should be replaced as well. Pay close attention to all of the toys and perches as they should be replaced when they start to look tattered. 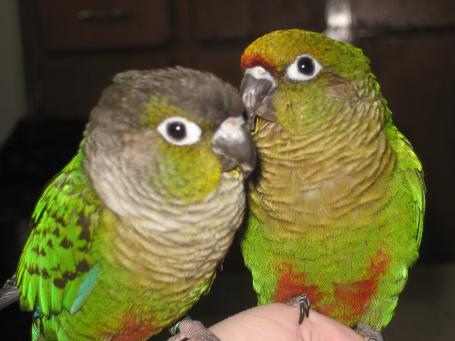 Green cheek conures are considered to be very social birds and enjoy as much human interaction as possible. Chlamydiosis – Symptoms include appetite loss, discharge, green feces and/or fluffed feathers. Diarrhea – The stool won’t appear formed, often due to parasites or from multiple causes. Feather Plucking – Happens when the bird is either bored, has a poor diet and/or is related to an unknown illness. Polyoma Virus – Symptoms may include weight loss, anorexia and/or lethargy. Green cheek conures talk – how do they sound?